Racism And Michelle Obama: In Support Of Self-Censorship : NPR Public Editor An ambiguous quote about the first lady by an attendee at a Romney American Legion event did injustice to blacks, veterans and the attendee herself. Many listeners heard hate speech. If so, did NPR share blame? Should reporters even care how the audience might react? 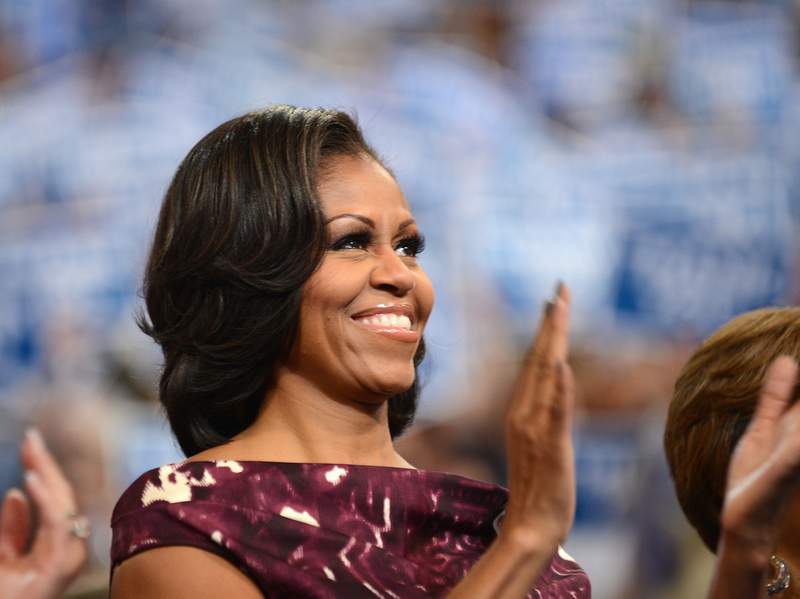 First lady Michelle Obama at the Democratic National Convention in Charlotte, N.C. Following Mitt Romney recently to an American Legion convention in Indianapolis, correspondent Ari Shapiro worked the audience with his recorder as he waited for Romney to speak. It was, he would say in his report, "not an Obama-friendly crowd." He aired comments from Bobbie Lussier, a veteran's wife, as illustration. "I just—I don't like him," Lussier said of the president. "Can't stand to look at him. I don't like his wife. She's far from the first lady. It's about time we get a first lady in there that acts like a first lady and looks like a first lady." Alarm bells went off in NPR's listening audience. Many wrote to complain that Lussier's interview should not have been aired, but for different reasons, each of them compelling. "I find this quote highly offensive, likely racist and clearly outside the range of acceptable dialogue and exchange regarding politics and the upcoming election," wrote Jonathan Hertz from Allentown, Pa., representative of one group of listeners. Val Larsen of Bridgewater, Va., and others said that the comment went beyond offense to African Americans and the first couple to offend veterans. "By using just that one quote to characterize the views of the conference attendees, you implied that these racist views are typical of veterans," he wrote. "To slander them by implying racist views and political motives is a gross breach of our social contract with soldiers, sailors, airmen, and marines." And Tom Kenny, of Gilbert, Ariz., said it was unfair, and maybe slanderous, on a third front that at first might seem surprising: to Bobbie Lucie herself. "The report left me and possibly others with the impression that the speaker is a racist. In fact, the report failed to establish that," wrote Kenny. "Assuming this was not a case of editing, Mr. Shapiro should have followed up with the simple question, 'What should a president and first lady look like?' The report may have left the audience with a totally wrong impression about the individual." I leave it to listeners to interpret her comment as they wish, but I have to disagree that if a comment reflects racism we should refrain from airing it unless a story is explicitly about racism. Over the course of the campaign I've put hundreds of voters' views on the air. Imagine for a moment that some percentage of those voters told me, "I won't vote for President Obama simply because he's black." If I excluded that sentiment from any stories that weren't explicitly about racism, I think I'd be presenting a distorted portrait of the electorate. Lots of people tell me "I'm voting for Romney because of his business experience," and I'd never think to restrict those voices to stories that are explicitly about business. No one voice will ever be wholly representative of Americans' views on anything, which is to say that listeners should not hear a particular quote as representing a universal view. But my goal is to paint a complete picture over the course of the campaign using a pointillistic approach, where each voter's voice is a dot of color that, viewed together from a distance, reflects the 2012 electorate in its entirety. Her comment may make people uncomfortable. But I don't consider that to be an argument against including her in the story. Shapiro separately tweeted about the matter of a follow-up question: "Lots of ppl asking if I followed-up w the woman in my @MorningEdition piece. No. Romney's speech was starting so I had to run & tape him." I'm a great fan of Shapiro's work, and I think that he is right that a story need not be about racism to include a racist comment by someone. But I think that he and his editors were wrong to let Lussier's interview run without clarifying what she meant. If she indeed was being racist, then I would have to question how representative she was of the audience. To viscerally not like President Obama and Michelle Obama is one thing. Many Democrats felt the same about former President George W. Bush. To not like the Obamas because they are black is another thing altogether. This is hate speech that offends a whole class of Americans (and many, if not most, of the rest of us). We as citizens need to know how many among us share such views, and it should be reported so that an informed citizenry can choose how to react. But if a racist comment is presented as just a gratuitous interview without useful context, then we as journalists have behaved irresponsibly, inflaming the country and lending legitimacy to hate. Some in the profession might call this self-censorship. So what? I once took today's common journalistic stance that it is not our place to self-censor, that press freedom and honesty means hands-off, laissez-faire reporting, whether the public likes it or not. But I'm a lot older now, and I have seen how the news media has contributed to polarization and to the loss of the media's own public support and trust. To be an ayatollah for an imagined ethic in which the news media should not take into account how the American audience will receive something is self-defeating and wrong. We have always self-censored. The wiser stance is to discuss what and how, and do it openly with the audience, however subjective the standards might be. In this particular case, I have no idea what Lussier meant. But the fact that so many of us immediately thought that she was being racist says that race is still an issue in the body politic, even if the sort of racial hate, violence and discrimination that I knew growing up in Georgia is largely a thing of the past. The Lussier quote is ambiguous, however, precisely because Michelle Obama doesn't in fact act and look like previous first ladies. She's been known to shop at Target and dance around with students as part of her "Let's Move" campaign. She is muscular and wore a sleeveless dress in her first official photo op. Four years later, news reports still mentioned her arms when covering her DNC speech. If there's a problem here, it's not that the comments are racist. The problem is, I don't know if they're racist. I don't know, in fact, what the woman meant when she said any of that. I have a strong suspicion, but I could be completely wrong. When she said she couldn't stand the look of the president, was she talking about his race or his ears? When she implied that Mrs. Obama doesn't look like a first lady, did she mean that she's not white or did she dislike the way Mrs. Obama wears sleeveless dresses? I believe a reporter's obligation here is to ask the question "What do you mean?" and either use the answer in the story or tell the listener whether the follow-up question led in one direction (racist) or another. Several people, including the woman now adjudged by many as a racist, have a stake in that question and answer. I can't tell from the piece whether the question was asked. Even if we "know" that something someone says is racist or hateful, there's great value—for the source and for the public—in asking another question. It may not be "What do you mean?" But it might be: "People will hear that as a racist statement. What would you say to them?" What it allows is for the story to use reporting to go beyond words and get to meaning and guide conclusions (rather than just letting people draw their own). The answer to the second question also allows the journalist (and NPR) to demonstrate that we understood we were in this offensive territory and weren't being cavalier in putting that stuff on the air. The second question further informs; deepens our understanding of what's being said. That's all better journalism. I make that point to push this conversation out of the predictable—and false—dichotomy that suggests we either offend our audience or coddle them. Better journalism informs them. Simple as that. It is understandable that Shapiro ran out of time to ask the follow up. But then the incomplete interview should not have been aired. Journalists have to report on all of the above, and should. But the list is a good reminder that each of these is special in how they are received by American society. Each of these should be reported and edited with care, whether you call that self-censorship or not. Since this post was written Shapiro has been involved in a public debate over whether or not he should have stood up for the Pledge of Allegiance at a Romney rally. He responded in a post on the "It's All Politics" blog. You might have thoughts you want to add. Assistant to the ombudsman Lori Grisham contributed to this report. The original post misspelled Bobbie Lussier's name owing to an error in the Aug. 30 transcript. Both reports have since been corrected.